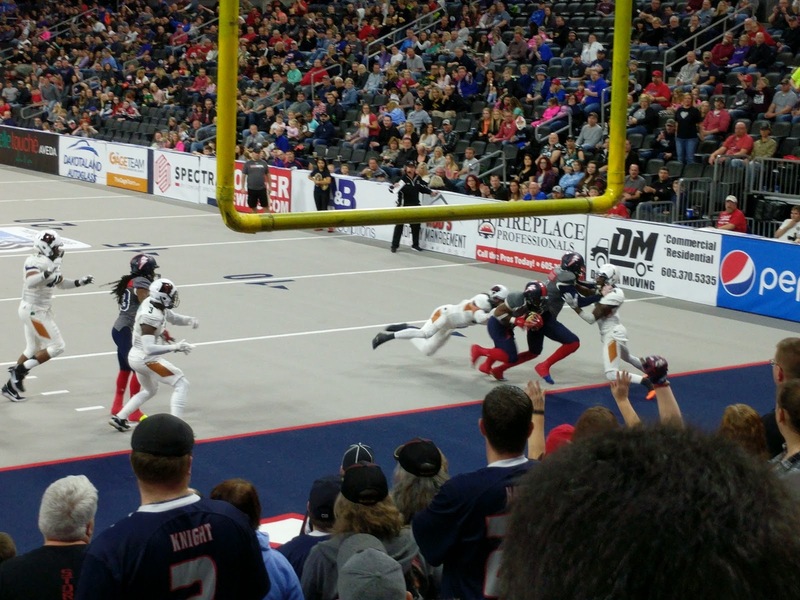 With this Point After Touchdown attempt, the reigning IFL Champion Sioux Falls Storm #19, Justin Syrovtka ("Sarah-Vodka"), successfully ties the Arizona Rattlers with a score of 14 to 14 in Sioux Falls' 2017 home opener at the Storm Shelter on February 17th with 7:14 to go in the 2nd Quarter. Are you ready for another Indoor Football League Championship? The Arizona Rattlers have left the NFL's Arena Football League after missing with their try when they hosted the AFL Championship and fought the Philadelphia Soul in ArenaBowl XXIX on Friday night, August 26th, 2016. With great confidence, they have come into the IFL in 2017 and run through an impressive list of opponents to be crowned the current 2017 Intense Conference Champions with a win-loss record of 13-4. The Rattlers can be confident with a 9 straight win streak going. 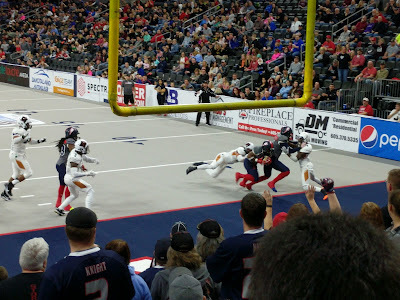 But they are running straight into the Sioux Falls Storm, with their own superior 15-2 record, and who have met and conquered the Rattlers in their home opener this season. In fact, the only team that Sioux Falls has not conquered this year was the Witchita Falls Nighthawks, who didn't quite make the playoffs this year. Although the Storm did vanquish the Nighthawks once, and the Nighthawks have come out on top against the Rattlers. The Iowa Barnstormers won against the Rattlers, and we defeated Iowa to play in the United Conference Championship, as well as defeated them in the championship for the United Conference Trophy. This is not to say that Arizona isn't a tough team. the only other team that the Rattlers lost to was the Spokane Empire, who Sioux Falls played in the 2016 United Bowl. But the Rattlers played the Empire 3 times and won 2 of those contests. And Spokane's head coach has been keeping his teams in IFL playoff contention perhaps every previous year before. Spokane is no slouch. In fact, you could say that it was the Rattlers that kept the Empire out of the playoffs this year, since they played each other thrice and Arizona came out on top. The Rattlers had to defeat the Nebraska Danger in the Intense Conference Championship on June 24th, and we have met the Nebraska Danger for the United Bowl quite a few times previously. The IFL really is getting competitive, especially this year, and I might add, especially in the United Conference. Three United Conference teams arguably had comparable or better records than the Rattlers did, and the Arizona Rattlers lost to each one of them; the Storm (15-2), the Barnstormers (13-4), and the Nighthawks (12-4). 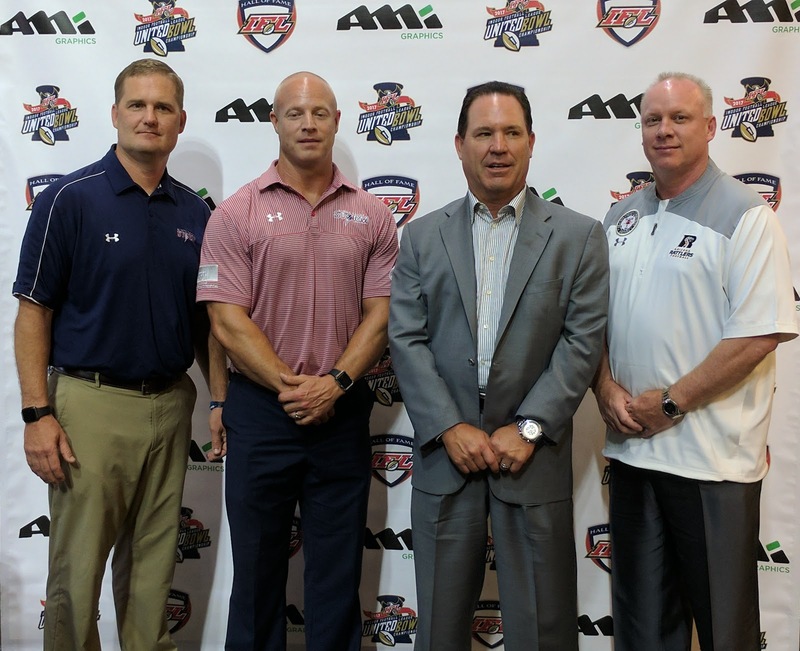 And although the IFL only sports 10 teams again this year, the AFL (Arena Football League) only has 5 combatant teams this year. The Barnstormers, Empire, and Rattlers had all left the AFL. I bring up this point since Storm football has so many haters. This is understandable when a single team dominates the sport with such authority. 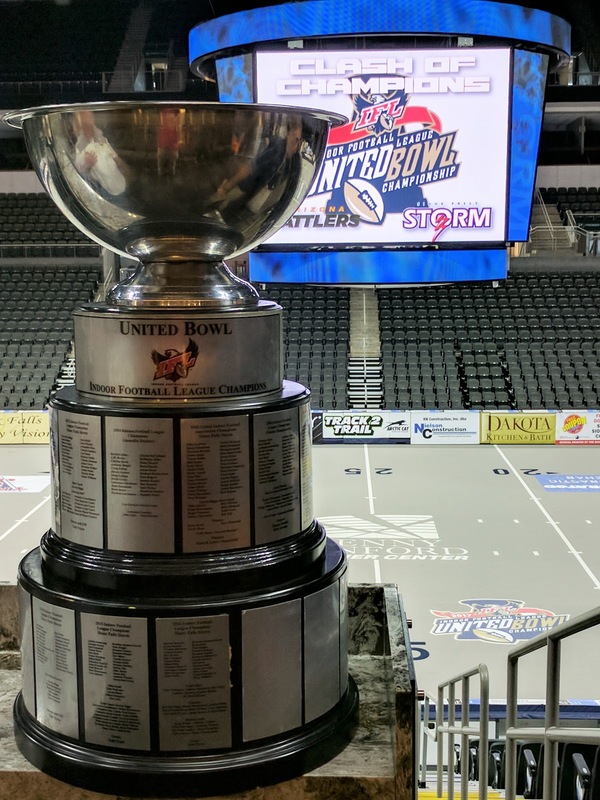 The Sioux Falls Storm has won the past 6 United Bowls. The Storm was banned from the first IFL playoffs and lost only their very first attempt in the United Bowl against the legendary Billings Outlaws of the Intense Conference. 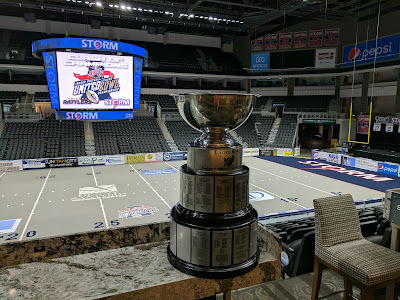 Before the IFL was formed from merging the United Indoor Football league and the Intense Football League in 2009, the Sioux Falls Storm had won all 4 UIF Championship titles. When United Indoor Football and Intense Football League merged to recreate the new Indoor Football League, champion teams from each outfit competed to name the IFL championship bowl game. 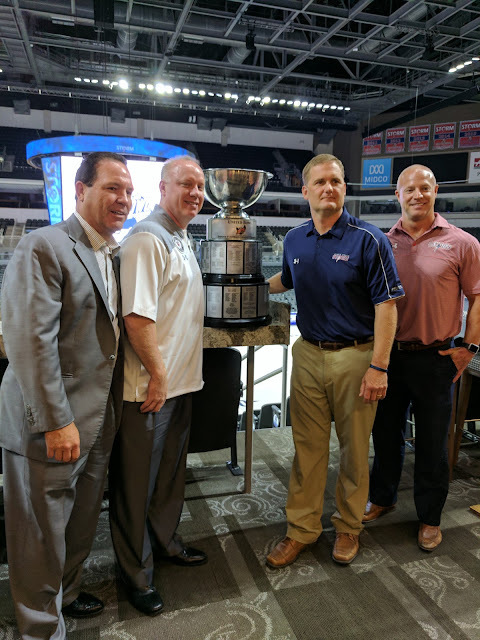 It was then that the Sioux Falls Storm hosted the Billings Outlaws in an exhibition game that named the United Bowl Trophy Cup. 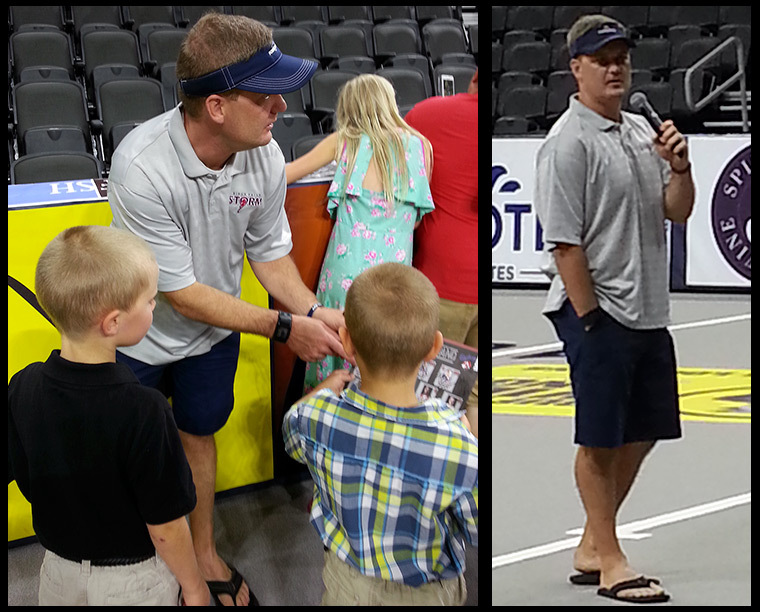 Storm Head Coach Kurtiss Riggs (winningest head coach in Indoor Football). 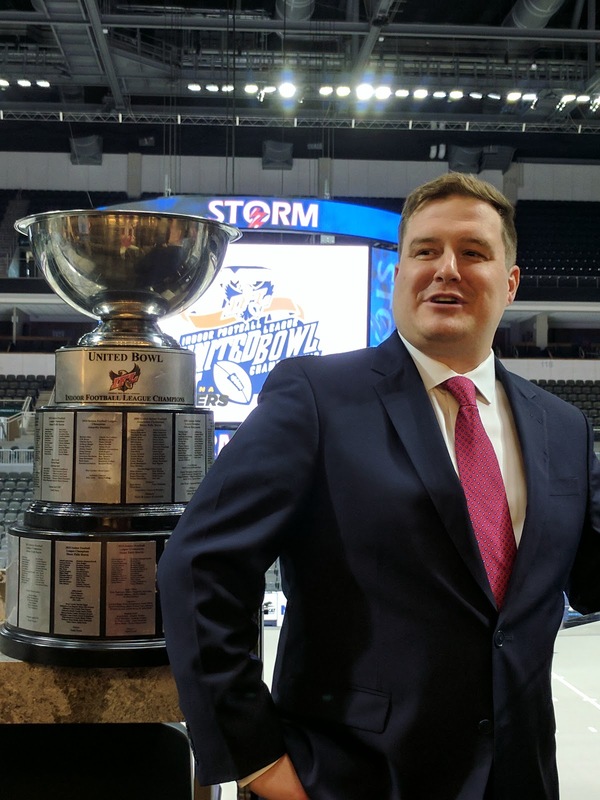 The common denominator for the Sioux Falls Storm's success has been Head Coach Kurtiss Riggs, who after playing with the team in 2000, it's inaugural year when they were known as the Sioux Falls Cobras, as well as the next year when they became the Storm, advanced into an offensive coordinator position in 2002 and arrived at the Head Coach position in 2003. As far as I know, Coach Riggs has been the winningest head coach in all of Indoor Football. Name a league. I do not believe that there is another head coach in any of them with 10 league championship rings and 11 conference titles. Robbie Rouse's rushing Touchdown puts the Storm within two points of the Rattlers late in the 2nd Quarter. That kind of performance record gets the fans of the opposition pretty jealous. A great deal gets said and people get all Trumped-up on their frustration and muted excitement. But that's football, there always is a loser. The real issue is that failure teaches lessons and when the right adjustments reflect the lesson learned, a championship culture can thrive. That's right, culture wins. As the Storm competes for their 11th league championship, already with a dozen conference titles under their belt, be sure to realize that they know they don't have this in the bag. No one wins without doing the work. And despite the fact that the Storm only has 6 ALL IFL players, expect the whole team to count when it matters, every chance they have. We will never back down, we are Storm Nation. Come to our house, Rattlers, we will show you a rock'n loud good time and enjoy the thrill. Nothing or no one will stop us on our quest for ring 11, now. This is still our dynasty and we will not relinquish it. But there is no overlooking the looming threat of the Arizona Rattlers. They are known spoilers. Respect is due. To dismiss the threat that the Rattlers present would be a catastrophic mistake, nor would we think of doing so. In the Storm's home opening game, the Rattlers lead us with a 21-22 score at the half, and then with 7:28 to go in the third Q, the Storm trailed Arizona 21-29. Luckily, the Storm Thunder Defense stepped-up, as we often ask them to do. We will ask it of them last time for this season. It's time to put a cap on a great season. Let's Go STORM!! !